IMPORTANT: The June 2018 program has been cancelled due to low enrollment. Update January 2018: The program for June 2018 has been cancelled due to low enrollment. No decisions have been made with regard to possible future programs. All Lerner College graduate students, including international students, may apply for this program. Enrollment is limited to approximately 15 students. International students should be sure to read the information (below) about visa requirements. This page provides an overview of the program, plus information on locations, topics and courses, schedule, costs, application process, and faculty contact information. A separate page (opening in a new window) answers frequently asked questions. Who this program is for: This program is open to all University of Delaware graduate students. Because space sometimes is limited to about 12 students, first priority will be given to graduate students taking classes in the Alfred Lerner College of Business and Economics. 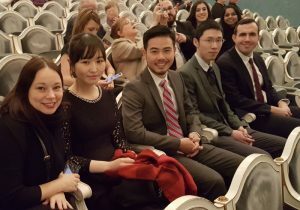 In past years, students from various Lerner College graduate programs have taken this program, including MBA, MS International Business, MS Accounting, MS Finance, MS Economics, and others. In addition, students from other UD graduate programs occasionally have taken the program. If you are an MBA student, this study abroad program will give you credit for the required course, BUAD 840, and for an elective in international business. If you are in a different graduate program, check with your advisor as to how the courses provided by the study abroad program will count toward your degree (for example, as electives, or as substitutes for required courses). Important note for all students: You will need a valid passport. Citizens of the USA and Canada do not need a visa. International students should read the next paragraph regarding visa requirements. 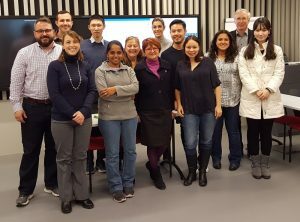 Program Overview: This study abroad program consists of six credit-hours of graduate business courses during the summer term (June) 2018: BUAD 843 (Special Topics in Global Business) and either BUAD 840 (Ethical Issues in the Domestic and Global Business Environments) or BUAD 867 (Ethical, Social & Political Issues in International Business). of and tensions within the European Union (such as trade and immigration policy), (2) the opportunities and difficulties facing transition economies (involving topics such as labor market conditions, innovation, corruption, management practices, and business-government relations), and (3) the continuing transitions of the business world in the once centrally-planned economies of the region. 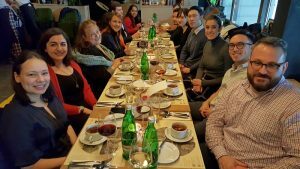 The program brings students face to face with managers, scholars, government experts, and other key decision makers in central Europe, who are both leading and adapting to ongoing change in the business world. policies. Contemporary economic problems and opportunities make this a particularly interesting time to visit these countries, due to the effects of multiple recent events (the 2008 financial crisis, mass immigration, etc.). In addition, the the European Union generally faces multiple challenges, concerning the common currency shared by many countries in Europe, and the economic and political decision making structures of the European Union. The program includes teaching by faculty from the University of Delaware plus faculty and experts from central European universities, businesses, government agencies, and/or non-governmental organizations. 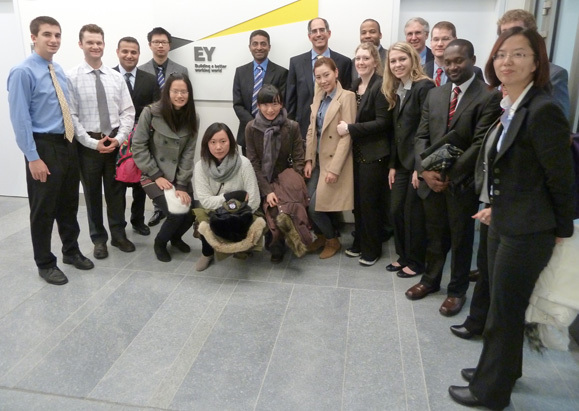 See the frequently asked questions file for examples of company visits and guest lectures. Or view photographs from the programs here. There will be preparatory reading, viewing and writing assignments, and also will be individual writing assignments to complete after the travel portion of the program. Program and course information, and course content, will be provided by a mix of meetings on campus in Newark and online. Students who wish to extend their stay in Europe a few days after the two week class travel period may do so. Cosmopolitan Budapest is one of Europe’s most historically prominent and culturally wonderful cities. Budapest is among the most popular tourist destination in Europe, and a major center of operations and investment by major western European and North American corporations. 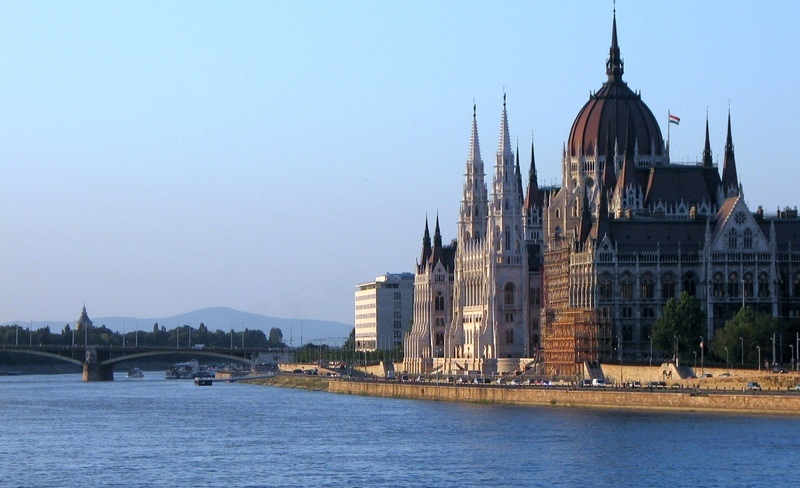 Sitting astride the Danube River, it has been a key city in many important eras of world history. Budapest sits on the site of the ancient Roman empire city of Aquincum; one can still visit the Roman ruins. As the Ottoman (Turkish) Empire conquered much of Europe in the 1500s, Budapest became the Ottoman regional capital. Later Budapest became, with Vienna, one of the two key cities of the Habsburg dynasty (i.e., Austro-Hungarian Empire); the Royal Palace is one of the major tourist sights in the city. 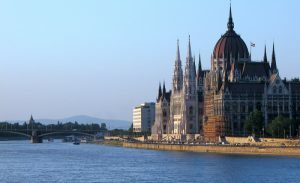 More information about Budapest is available from the Budapest tourist information site. Krakow is the second largest city in Poland, and one of Poland’s oldest and most historic and well preserved cities. It is one of Poland’s key centers of cultural and academic life, and a major economic hub for Poland (Europe’s sixth largest economy, and the largest economy in the eastern part of Europe). See more information, and photos, at the Krakow tourism and business development website. 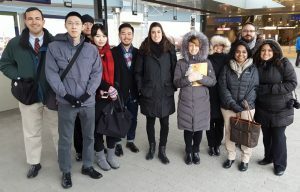 Other travel opportunities: Portions of weekends, and some (but not all) evenings, offer free time in each city, but do keep in mind that this is program is for 6 academic credits, and so our weekdays are quite full with learning activities and classes (just as a business trip overseas would be full with non-tourist tasks). But if you want to travel in Europe before or after the program ends, check rail and air schedules in Europe; it is easy to get from the cities we visit to other European destinations. economy offers new opportunities for investment by western companies, but new challenges insofar as the culture and politics of former centrally planned economies is often different from what western European and North American executives are familiar with. And it provides challenges for local decision makers in these countries, as even the larger economic system they joined in the 1990s now undergoes a series of radical pressures and changes due to the recent financial crisis, competition from other economic regions, mass immigration, the rise of populist nationalism, and other economic, social and political changes and challenges. Students take BUAD 843 and either BUAD 840 or BUAD 867. BUAD 843 (Special Topics in Global Business) focuses on two key topics: (a) the growth, development, and problems of the European Union, and its implications for doing business in Europe, especially in the context of the recent financial/economic crisis, recession, demographic changes, and other challenges; and (b) the problems and issues that North American and European corporations encounter when they do business in transitional economies such as those of former Communist bloc countries. Both topics provide excellent case study approaches to understanding more general questions of how changes in the business environment affect the strategy, marketing, and management of global businesses. 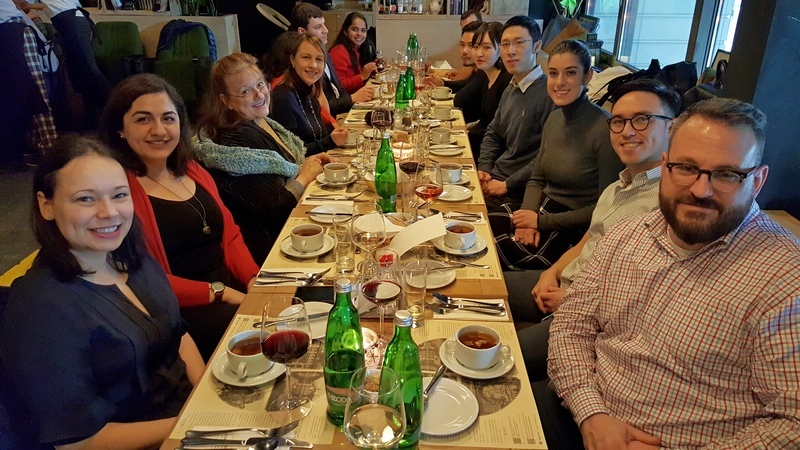 The course will involve company and institution visits in central Europe, class meetings in Europe featuring European faculty and guest lecturers, and a few online or on-campus classes in Newark. Grading and written assignments are the responsibility of Prof. Gary Weaver from the University of Delaware. BUAD 840 (Ethical Issues in Domestic and Global Business Environments) focuses on how managers effectively address the growing array of ethical, legal, and societal expectations placed on businesses. Doing this requires a good understanding of both organizational processes and the external political, legal and social environment of business. But these issues become even more complex in a global, cross-cultural setting. For example, what is considered a bribe in one culture may be seen as a culturally obligatory courtesy in another; relationships between the business and government worlds may be antagonistic and disconnected in one political system, and deeply integrated in another. In addition, expectations for good business behavior vary; the European business environment, for example, places a much stronger emphasis on sustainable business practice than does the American business environment, and many observers make clear distinctions between Anglo-American and continental European views of business and its responsibilities. As in the case of BUAD 843, this course will involve company and/or institution visits in central Europe, meetings with European faculty and/or guest lecturers, and a few online or on-campus classes in Newark. Prof. Weaver will also be responsible for grading and written assignments for BUAD 840. 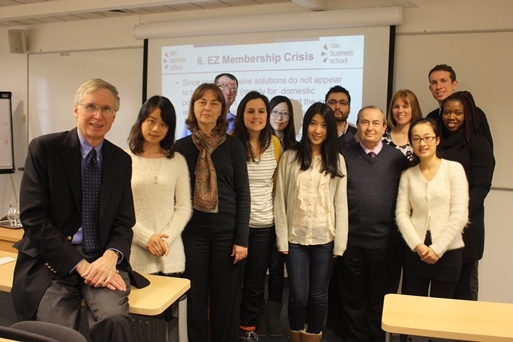 The version of BUAD 840 being offered in this program is cross-listed with BUAD 867 (Ethical, Social, and Political Issues in International Business). This is so students who already have had BUAD 840 on campus (which primarily has a domestic focus) can also take and receive credit for this program (which will give them a more extensive international perspective on ethical, political and social issues in business). Students will register for either BUAD 840 or BUAD 867, but not both. If you have not already had BUAD 840, and enroll for this study abroad program, you should enroll under BUAD 840, not BUAD 867. Spring semester, 2018: There will be two or three evening meetings during fall semester. These are to provide students with information on the trip, plan logistical arrangements, and provide an introduction to some of the issues and insights to be considered. Late May/Early June, 2018: Online and/or classroom-based learning (most probably online only) about business, economic, cultural and historical aspects and issues of central Europe. Detailed information about these activities and assignments will be announced around April 2018. Actual travel will be for two weeks in June, 2018, and normally follows a schedule like the following one; also, we often visit Bratislava (capital of Slovakia) as a day excursion from Vienna. Day 1 (usually a Friday): Most students will depart the U.S. during the afternoon or evening this day, for next day arrival in the first city. You may leave earlier provided you get to the first city on time, and also complete your pre-travel assignments. Day 2: arrive city #1. Days 3, 4, 5, 6: meetings and activities (including cultural tour) in city #1. Days 7-12: meetings and activities (including cultural tour) in city #2. Day 12: travel to city #3. Days 12-16: meetings and activities (including cultural tour) in city #3. Day 17 (usually a Sunday): depart city #3 for home. Students will need to pay tuition for 6 credits (two courses), either in-state or out-of-state rates, depending on your status. The approximate program fee is $3325, plus or minus a little. Exact cost estimates fluctuate with the value of the dollar, plus changes in local costs. The program fee estimate will become more exact later in the year. IMPORTANT NOTE: The program fee does not include airfare. 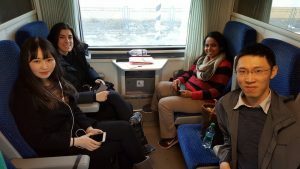 For this program, students will be expected to purchase their own air tickets to and from Europe. This will allow maximum flexibility for setting your own travel schedule in regard to any extra travel (or for using frequent flier miles, or for combining the program travel with work-related travel). For the 2017 program airfares were in the range of $880 to $1100, depending on airline, and exact travel dates, and when students bought their tickets. In addition to the program fee, you should allow at least $35 to $40 per day for additional expenses, and more if you’re a “big spender.” This should be enough to cover basic meals that are not included in the program fee, plus some bus or transit fares you might need. This additional amount, of course, might be higher or lower, depending on your interest in more expensive activities (e.g., entertainment, nice restaurants, extra travel, etc.) or, alternatively, simple, cheap food. Almost all reading materials for the classes are available online at no charge for University of Delaware students (via the university library’s online databases). Typical cost for reading materials are about eight dollars. Important visa information: You do not need a visa to enter the European countries if you are a citizen of the USA, Canada, Mexico, UK, most European nations, Japan, Taiwan, many (but not all) South and Central American nations, Australia, New Zealand, and a few other countries. If you are in the USA on a student visa, your USA visa must allow for multiple entries to the USA (typically your visa will show a letter M for multiple entries, or else say “multiple”). The central European countries we visit will not give you an entry visa unless you can show them that your USA visa will allow you to return to the USA. If your USA visa is only for a single entry, you would need to return to your home country and try to get a multiple-entry USA visa, and then apply for a visa to enter the European countries. You cannot apply to change your USA visa to multiple-entry permission while you are in the USA; you must do this at a USA embassy or consulate outside the United States. Application process: The program usually is limited to approximately 12 to 15 students, although sometimes we are able to raise this number slightly. Visit the University of Delaware Institute for Global Studies for the online application process and forms, and to get additional information on the program. Apply here. All else being equal, it is to your advantage to apply early; later applicants risk being put on a waiting list. Applications will be accepted until mid November, 2017. Acceptances will be announced in December, 2017. Please note that the online application forms are standard forms used by both undergraduate and graduate programs. Some of the questions (e.g., parental/guardian permission, staying with a host family) might not be directly relevant to this graduate-level study abroad program that uses hotels for lodging. Answer them as best you can. Also, please be sure you apply for the program called “MBA/MS Europe” and not an undergraduate Europe program; the graduate level central Europe program is titled “MBA/MS Europe”. For other questions, contact program director Prof. Gary Weaver at 302-831-4568, or by email at gweaver “at symbol” udel.edu.